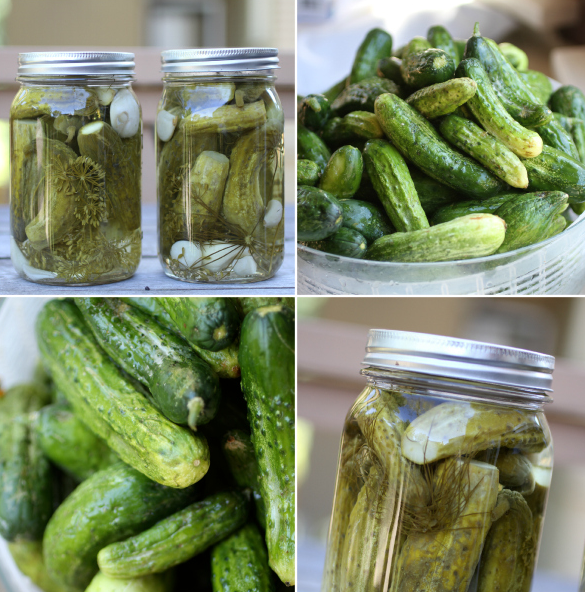 We recently shared with you a recipe for pickles and mentioned that there is another method for making them. We found this recipe by A Couple Cooks. Alex and Sonja (hi! and thanks!) provided a very clear explanation on how to make them; and we consider this is way easier and faster (both to make and enjoy)! Wash two mason jars and lids in hot soapy water, rinse, and let air dry. Quarter the cucumbers into four slices each, lengthwise. Cut 3 cloves garlic in half. If desired, slice 4 chili peppers in half and add to the jars for a little extra heat! In a spare mason jar or covered container, combine 1 tablespoon coriander seeds, 1 tablespoon whole peppercorns, 1 tablespoon sugar, 1½ tablespoons kosher salt and ⅔ cup white vinegar. Tightly close the lid and shake vigorously until the sugar and salt dissolve. Add 1 cup water to the mixture. In the two clean mason jars, tightly pack the cucumbers, garlic, and fresh dill (and chili peppers, if desired). Pour the brine mixture over the cucumbers. Tap the jars on the counter to release any air bubbles and top off the jar with extra water if any cucumbers are exposed. Place the lids on the jars and screw on the rings until they are tight. Leave the jars in the fridge for 24 hours before tasting. The pickles last up to one month refrigerated. Categories: Cucumber, Recipes | Tags: dill, pickles, refrigerator pickles | Permalink.